A beautiful emerald green Trinity Knot pendant which is cast in sterling silver. This lovely Irish pendant has a simple yet elegant design. The Trinity Knot is enclosed in the lower oval of the Celtic Knot and a green cubic zirconia stone sits below the Trinity Knot in a rubover setting. A beautiful gift for yourself or someone you love. 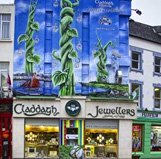 Claddagh Jewellers – The Celtic Jewellery Specialists- From Galway with Love!